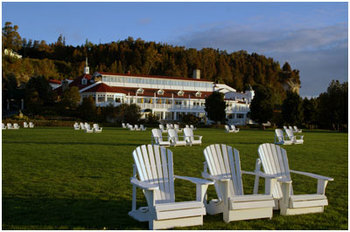 It is official, we will be heading to beautiful Mackinac Island again for a wedding this September. We are looking forward to filming Kristin & James wedding at Mission Point Resort. Which from this photo from their website you can see why we are looking forward to working with this back drop. We are looking forward to working with Carole Erbel who we worked with last year for Kristen & Billy's wedding. Not only does Carole create a unique and beautiful setting for your wedding, but she puts everyone at ease while she tends to all of the details of your wedding day. To see some of her work check out Billy & Kristen's video below. If you are planning a Mackinac Island wedding be sure to contact Carole to help orchestrate your wedding day. We will also be working with Melisa from Melisa McKolay Photography. If you haven't seen her work be sure to check it out at http://www.mckolayphoto.com, you will see why we are looking forward to working with them. Stay tuned this September for more from Mackinac Island. Until then you can see several segments of Billy & Kristen's Wedding at The Inn at Stonecliffe on Mackinac Island.